Visiting one (or more) of the National Trust Properties in Cornwall is a great thing to do in Cornwall whether you are on holiday or you live here. They have some lovely houses and gardens to visit and also have lots of different events going on and so can make a great day out in Cornwall. 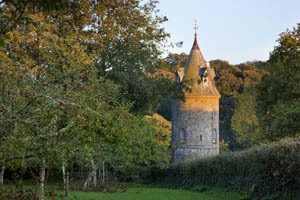 If you are a National Trust Member you may even be able to visit the properties for free – if not it could definitely be worth joining the National Trust if you are planning on visiting a number of properties or places (some of the Cornwall beaches are National Trust and members enjoy free parking). We have highlighted some of the National Trust Properties in Cornwall below. Below this you can view a list of What’s on in Cornwall at National Trust Properties. 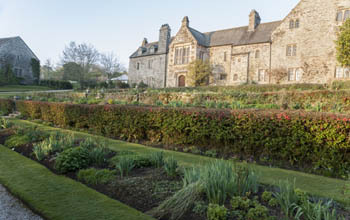 The National Trust property at Cotehele is a Tudor house set in magnificent gardens on the banks of the River Tamar. 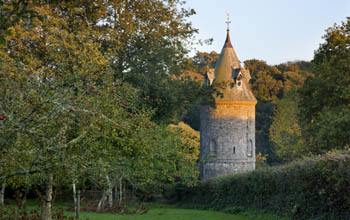 One of the leading Cornwall attractions Cotehele is well worth a visit. Once the ancestral home of the Edgcumbe family the house is decorated with tapestries, arms and armour, pewter, brass and old oak furniture. The interior tour has changed little over the years and retains a strong sense of history. Outside there are formally planted terraces to wander in and admire, or you can lose yourself in the Valley Garden, which includes a medieval stewpond and dovecote and leads down to the river. Image © National Trust Images/Carole Drake. Said to be the setting for Virginia Woolf's novel The Lighthouse, Godrevy sits at the end of St Ives Bay Cornwall and offers breathtaking and spectacular beaches, cliff walks and views. The well known Godrevy Lighthouse is a stunning site to behold and has a rich history. 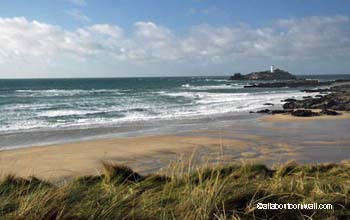 Famous for the Godrevy seals the beaches are just a couple of miles outside Hayle Cornwall and definitely worth seeing whatever the weather. Large car park for which a fee is payable by non National Trust members, seasonal cafe, ice cream van and toilets. This National Trust property is on an iconic rocky island crowned by a medieval church and castle and is home to a living community. Visit the Medieval Castle situated on the tidal island off the coast of Marazion. Walk across the spectacular cobbled causeway at low tide or take a ride in one of the boat taxis. Explore the island community, harbour, cafe and gift shops before entering the gardens and then the castle. Fantastic coastal views. Still home to the St Aubyn family the oldest buildings date from the 12th century. You can immerse yourself in history, wonder at the architecture and discover the legend of Jack the Giant Killer. Look down on the subtropical terraced gardens and enjoy the breathtaking views of spectacular Mount's Bay. If the weather is favourable you can take a short evocative boat trip to the island, or at low tide, enjoy the walk across the causeway from the ancient stannary town of Marazion, which is well worth a visit. St Michael's Mount, Marazion, Cornwall TR17 OHS. Tel 01736 710507. Full of exotic plants and spectacular views of Mounts Bay and The Lizard the National Trust property at Trengwainton near Penzance Cornwall offers 25 acres of wonderful gardens and grounds to explore and is definitely one of the things to do in Cornwall to consider if you enjoy beautiful gardens and scenery. It is one of the Cornwall attractions which is a dog friendly attraction in Cornwall and well behaved dogs on leads are welcome to enjoy the wonderful walks which Trengwainton has to offer. Image ©National Trust Images Andrew Butler. Outdoor activity event in Cornwall. One of the great things to do in Cornwall this week is to join The National Trust local rangers in their efforts to manage our coastal habitats. there will be a Community Beach Clean at Porthcurnick Beach from 10 - 11. The team meet on the first Monday each month at 10. Gloves, bags and litter pickers provided. Just bring your enthusiasm to help out for an hour or so. All ages welcome, children with ccompanying adults please. Dogs on leads are welcome. Please wear robust outdoor clothing and stout shoes. No booking required. If you are looking for outdoor things to do in Cornwall this weekend you could go along to the Apple Grafting Weekend in the lovely orchard at Cotehele. There will be more than 20 local apple varieties to choose from and the National Trust team will show you how to do it. No need to book. Take away a grafted tree for only a fiver. Booking not needed. Normal admission charges apply. Suitable for 16 years and above. Prices - Per Item £1 (graft material), Per Item £2 (root stock), Per Item £2 (workshop). Please see the main property page for open and closed days. Image NTI/Jo Whitworth. Booking not needed. Meet at Chapel Porth on the slipway onto the beach. Children welcome with a supervising adult. There is a short slope on to the beach and boulders and pebbles at the top of the beach. Wear suitable outdoor clothing and footwear. Meet at Chapel Porth on the slipway onto the beach. There is a short slope on to the beach and boulders and pebbles at the top of the beach. Wear suitable outdoor clothing and footwear.